Concrete blocks are a common material used in the commercial and industrial sector. Whether a truck ran into your warehouse, you have overhead door damage, or you require filling in an opening, we do everything necessary to match the existing work and apply structural requirements to ensure it meets engineer’s approval. When replacing or repairing block, we ensure concrete reinforcement & lintel support is also intact. 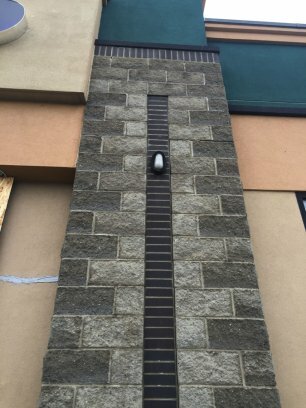 ACL Masonry specializes in all types of block applications such as foundations, vehicle impacts, diminishing walls, veneer walls, elevator shafts, firewalls, retaining walls, waste enclosures & more. Our products are manufactured to the highest standards, in a multitude of styles, colours, and designs that are sure to meet your needs and exceed your expectations. ACL came out to replace the grout in a leaky glass block shower, but discovered that it was actually the caulking causing the problem. They fixed it quickly and were genuinely concerned about solving my ongoing issue that others before them misdiagnosed. Very friendly, competent team and the cost was more than reasonable. I would highly recommend them! !